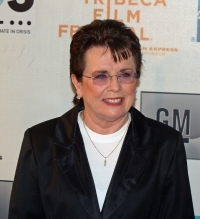 Billie Jean King. Photo by David Shankbone. Two weeks ago, Jason Collins, a professional basketball player, announced he was gay via an article in Sports Illustrated. As I write this blog entry, Collins announcement is still causing somewhat of a stir among sports media types. Sports media outlets pronounced this a ground breaking moment in major sports history. Collins has been compared to Jackie Robinson, the first black man to play major league baseball. There were polls, opinion pieces, and lots of speculation about what Collins announcement would mean for the future of LGBTQ individuals in sports. At about the same time, another story broke concerning John Paulk, who retracted his claim of having been “converted” to be heterosexual. For nearly 20 years, Paulk had proclaimed and preached that reparative therapy had enabled him to become heterosexual. Paulk’s announcement perhaps received much more attention in my village because he had worked for a national non-profit organization based in my community as director of a program that focused on convincing LGBTQ individuals they could successfully be converted to a heterosexual lifestyle. In the interview where Paulk came out, he apologized to all the individuals, as well as their families, for the pain and heartache his previous work had caused. Missing from all these conversations was any discussion concerning women and the LGBTQ lifestyle. There has been no mention of the significant number of female professional basketball players who have publicly shared their sexual preference. In addition, athletes (particularly female athletes) in other major sports such as ice skating, gymnastics, and tennis have been going public about their sexual orientation for several decades. In the conversations concerning John Paulk’s announcement, there has been no mention that Paulk’s wife of 18 years had also announced that reparative therapy had not worked, and she also was reclaiming her lesbian identity. What is fascinating to me about these conversations is the subtle and innocuous way prejudice is present in a discussion concerning openness and acceptance of alternate sexual lifestyles. Sexism is prevalent even in a discussion of sexism. Apparently, a woman coming out is not nearly as significant or important as a man acknowledging his sexual preference. Even in a discussion of acceptance and support for gay and lesbian athletes, the role of gender influences how important or how visible the matter of sexual preference should be. Not to be too Freudian here, but our sense of our sexuality plays a significant role in our self-identity and self-perception. Our sexuality is not just a matter of our DNA, but it also plays a huge role in the formation of our personality as well as our spirituality. First hand, I have experienced the damage wrought by abusive religious (and cultural) teachings as an individual struggles to be honest with him or herself about their sexual orientation. The guilt, the anguish, and the fear she or he suffered has been painful to observe. To encounter the isolation and rejection these individuals have felt and lived has been, for me, a life altering experience. In the growing discussion of and action for equal rights for the LGBTQ community, it is imperative that we minimize the role of gender. The sexual preferences of males must not be allowed to dominate the conversation, but rather we should focus on the rights human beings. If equal rights for those of the LGBTQ community are moved forward simply because men have publicly proclaimed their preference then the battle may have been won, but the war will have been lost. The freedom of both genders to choose their sexual preference without prejudice or judgment must be lifted up—to do otherwise is to maintain the centuries old hierarchy of male dominance.